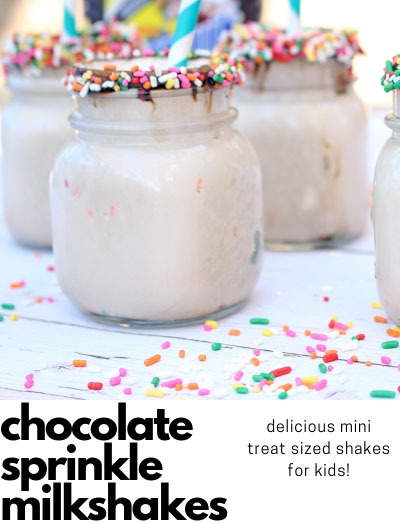 Disclosure: This post is in partnership with WORX. As always, opinions are all my own. Recently we decided to do more DIY projects around the house. We’ve lived in our current house for just over a year, and I still don’t feel like its as “homey” as I’d like. We painted our living room and kitchen, and the next step was trying to cozy the house up a bit more and make it really feel like ours. I love photos and I have always tried to take photos of my kids as much as I can. After losing my mom and grandparents (when I was 16 and 19) I realized how little photos I have of them and basically none of us together. I don’t want that for my kids so I try to take as many photos as possible! I just don’t have many in my current living room, that needed to change. 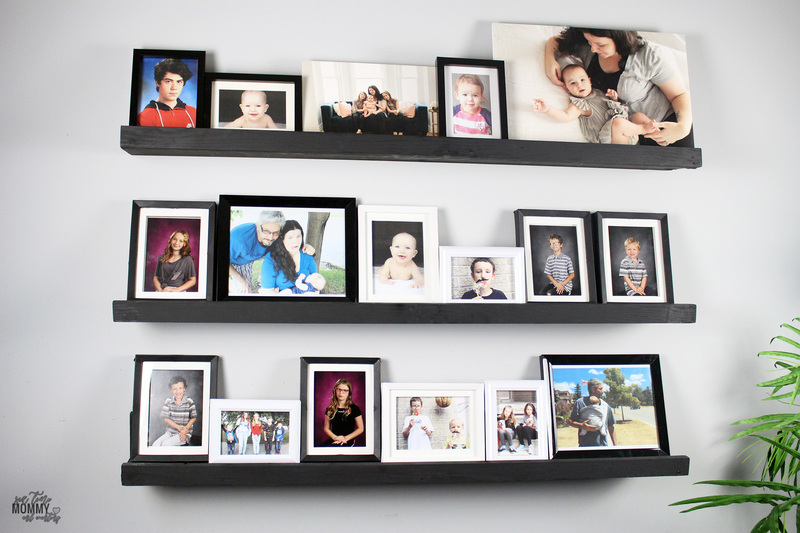 I love displaying photos, and as I’ve been only getting better at taking photos I want to display that as well. I’m tired of wasting money buying cheaply made shelving. We’ve moved a few times and although we are locked into where we live for at least another 5 years, I change my mind often and like moving rooms around, so if I change my mind I want to be able to move the shelves easily, and without issue. I haven’t found store-bought shelving that has not ruined our walls, or the shelves when I want to move them. 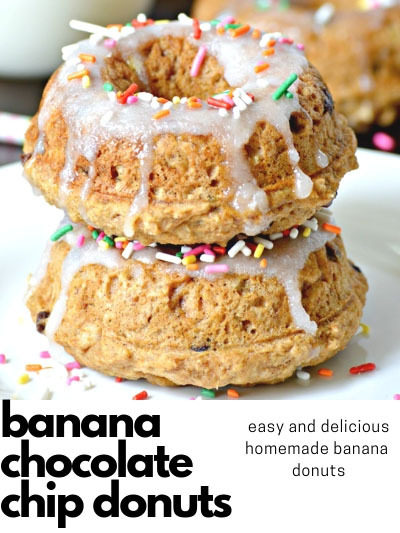 So, I decided we’d make our own! 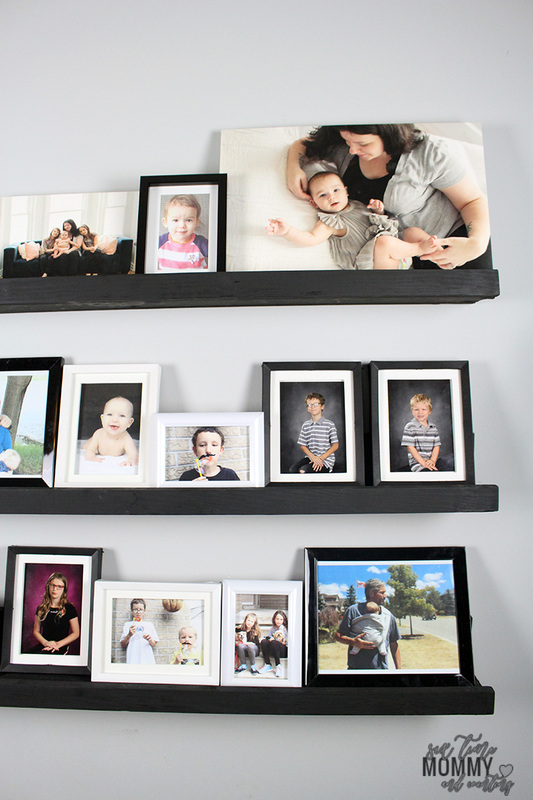 I want to do more DIY so why not start with a smaller, easier project? I was recently contacted to partner with WORX, which was great timing! 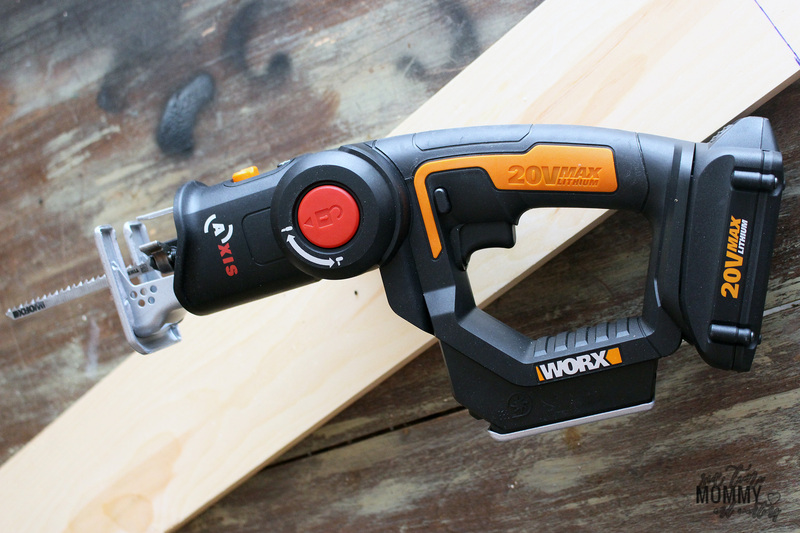 The Axis Cordless Reciprocating & Jig Saw by Worx was just what we needed for this project so I jumped at the chance! While we are pretty crafty and put together furniture when we moved we don’t have many tools. 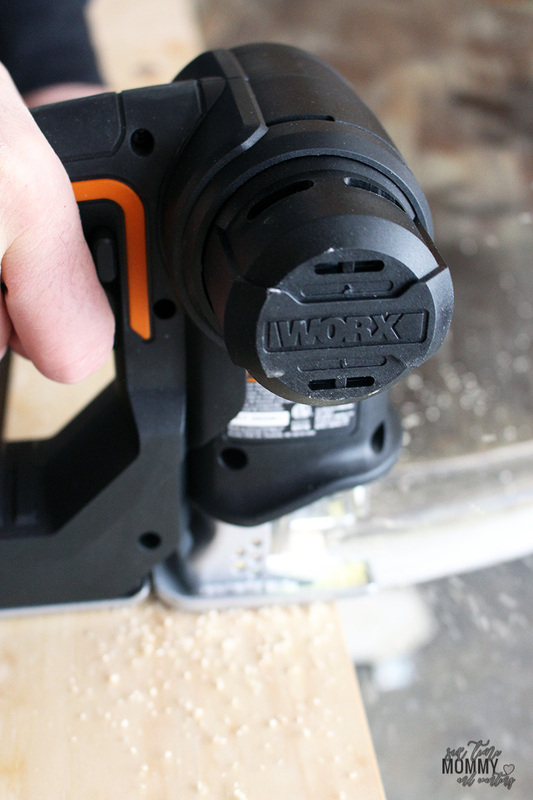 Nothing like the Axis Cordless Reciprocating & Jig Saw, which for this project was an absolute necessity. We needed to cut the wood, and be able to do it properly and without taking up much room in our already full garage. I love the idea of shelving they have at Pottery Barn but I don’t like the prices. 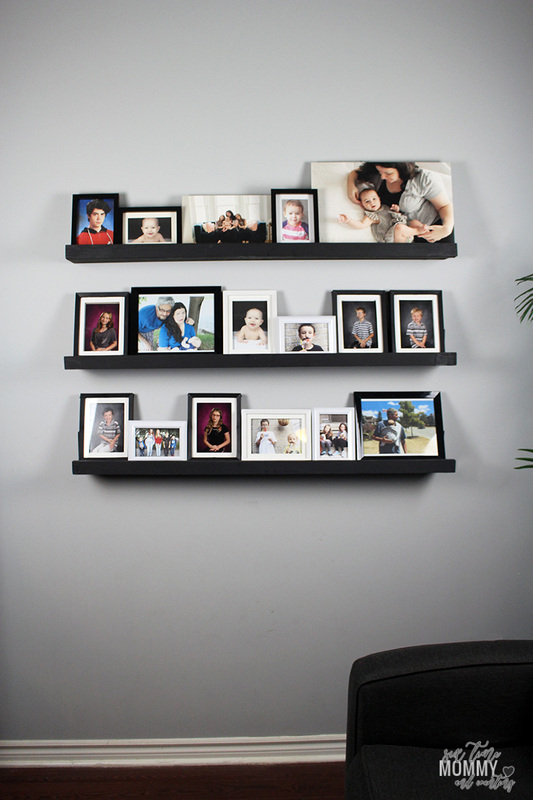 $91.00-197.00 is a bit much for one shelf, so, it was my mission to create something similar with half the cost. Now, let’s get started! 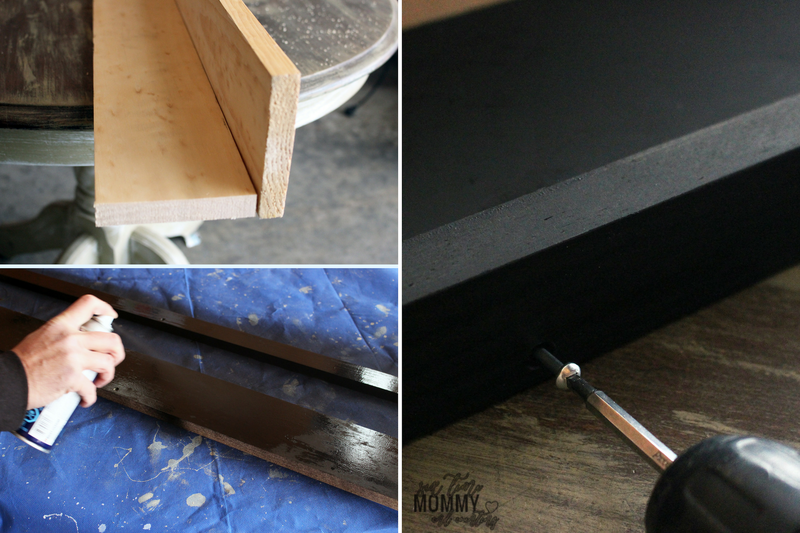 Dry fit your shelf and sand all sides and edges. Measure out 1″ wide by 1/2″ high markers for screws making sure to place a marker at 24″. Using your countersink drill bit, bore out the holes making sure that the head of the screw fits snug. Spray paint the boards front back and sides. Let dry. 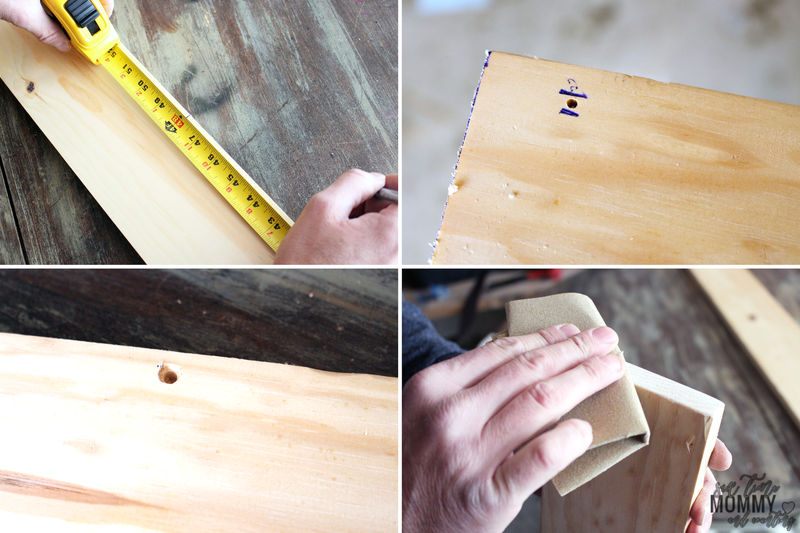 Attach your back piece and bottom of your shelf using 3 2″ screws. Do the same for the 1 x 2″ face strip. Mark out 3 holes in your back piece, level your shelf and countersink holes directly into the wall. Remove shelf and insert anchors. Replace shelf and screw into the wall. These shelves turned out to be exactly what I wanted and more. They look stunning on the wall, I’m really glad I chose matte black instead of a shiner black or a different color (I did toss around the idea of doing them white!) they turned out perfect and add a little extra personal touch to this space. Exactly what we needed in our big open living room. 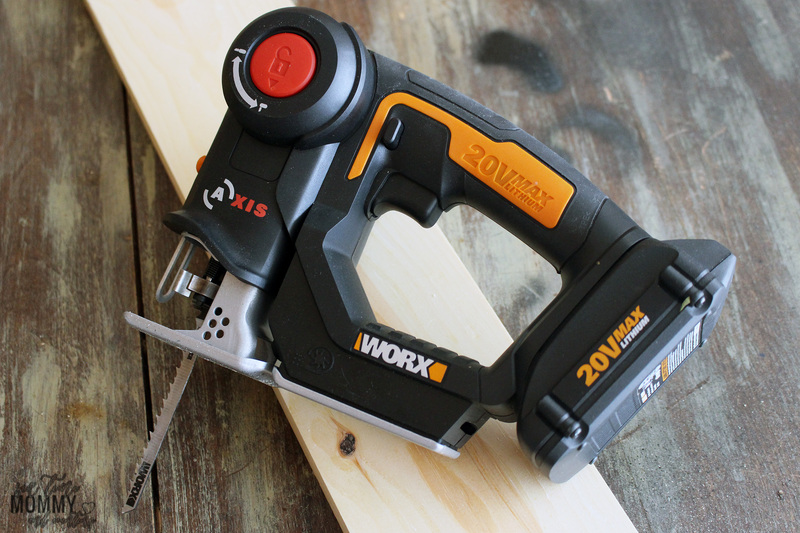 If you like doing projects around your house but aren’t too fond of having huge tools taking up space, the Axis Cordless Reciprocating & Jig Saw is an ideal tool for you. Although we do have a pretty big garage, we have a lot of stuff stored in there so big isn’t an option. The Axis is small and even good for me to use when I need to. A lot of other big tools aren’t. 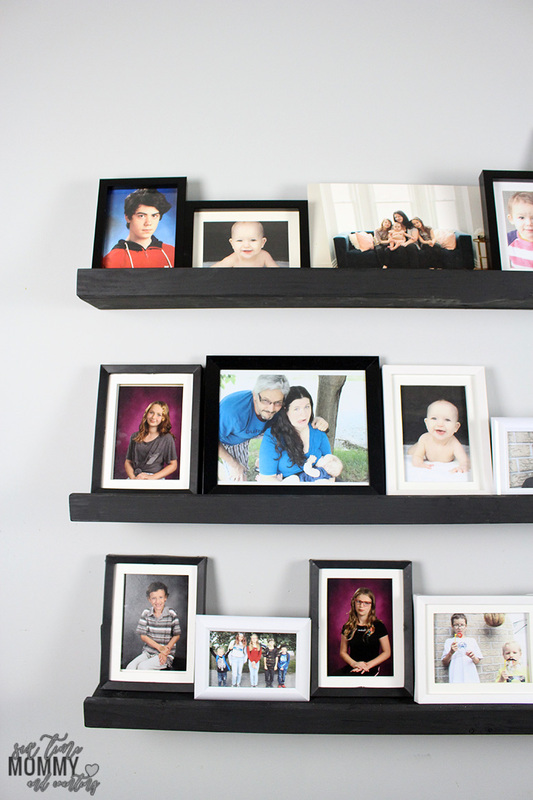 It’s perfect for projects around the house and keeping in a smaller space. Blade Change Made Easy: The tool-free blade change system lets you easily switch between a variety of standard blades to cut wood, PVC pipe, plastic, fiberglass, aluminum, copper, thin steel and even tree limbs & roots. Side Motor Location: This combo tool’s motor is located on the side of its body, allowing the motor and gearing to rotate simultaneously. 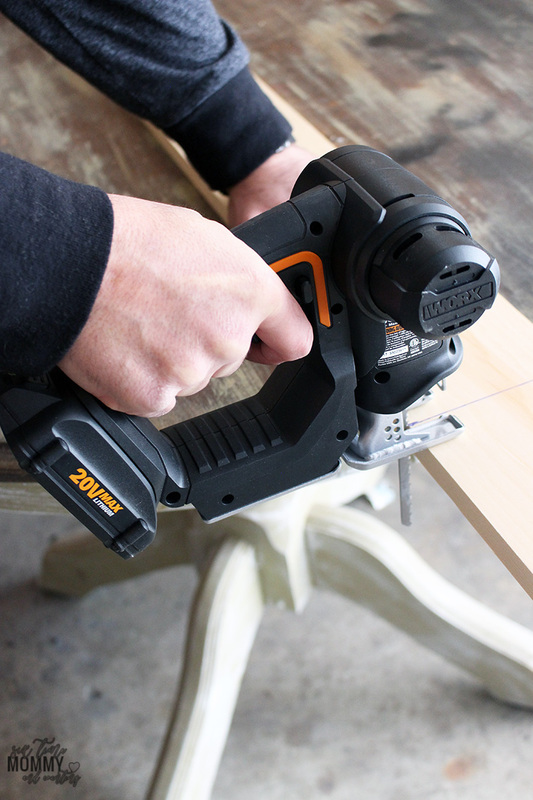 No slippage or misalignment, just smooth, constant power, and a more efficient cut. Share 20V Battery With Other Products: The powerful, efficient 20V MAX battery powers the Axis and the entire Power Share family of tools. Built-In Dust Blower and LED Light: The 20V Axis features a built-in blower to remove dust and debris, as well as an LED light which both drastically increases your cutting visibility. 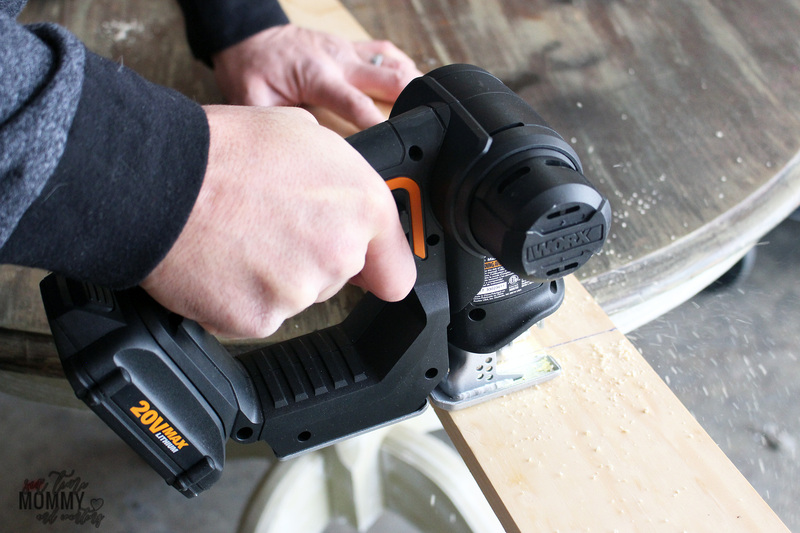 One Tool, Many Uses: This multi-purpose saw is great for making quick cuts both indoors and out, including rough-in work, moulding and drywall cuts, craft projects, plumbing & HVAC applications, and electrical work. If you are interested in trying out this convienent and powerful tool, click here. You can also use my code AXISMAC to receive 10% off and FREE shipping.